Genetic Prospects is a selection of papers on some of the most philosophically interesting aspects of modern biotechnology. It consists of 9 papers with an introduction; the papers are quite short, and the book is only 132 pages long. Most of the authors are associated with the School of Public Affairs at the University of Maryland and have backgrounds in medical ethics, philosophy, and law. The papers are especially concerned with the concept of "natural" and the criticism of genetic engineering that it is unnatural and therefore wrong. Most of the authors argue that generally such criticisms fail to justify their assumptions, but they do agree that some forms of genetic engineering are potentially troubling. Just to mention a few papers: In "Genetic Engineering and the Concept of the Natural," Mark Sagoff examines the concepts of the natural employed by the food industry. In contemporary western culture, it is clear that we place high value on natural foods and are suspicious of artificial foodstuffs. Sagoff points out that the distinction between natural and unnatural in such a context is not clear, but he appeals to John Stuart Mill's four concepts of natural to provide clarification in the debate. In an unusual move, Sagoff relates this to the case of Perditia in Shakespeare's The Winter's Tale, examining her defense of the natural. Paul B. Thompson follows up on Sagoff's paper, arguing that there is a further sense of 'natural' to be added to the debate, that is "based on the detailed and place-specific knowledge that farmers derive from following a farming strategy for many years." Robert Wachbroit examines the notion of normality and its relation to the concept of the natural. He points out that understanding what is normal for humans is different from discovering what is essential to human nature, and he concludes that those such as Fukuyama who want to draw conclusions about human nature from behavioral genetics are using flawed logic. In "My Fair Baby: What's Wrong with Parents Genetically Enhancing Their Children," David Wasserman examines several purported problems with genetic enhancement and argues that they are no worse than the action of parents who work to influence their children and improve their chances in life. Wasserman argues that there may well be a moral place for the genetic enhancement of children if it is done with restraint. These papers are written in clear English without undue reliance on jargon, and the authors arguments are concise. 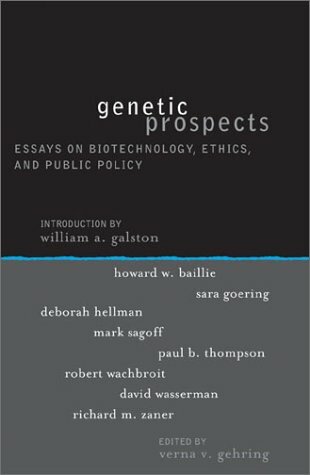 This book would be a valuable resource in an upper level undergraduate course in genetic ethics and it would be of interest to non-specialist readers who want to get a flavor of the current debates on the morality of genetic engineering. The papers make a solid contribution to the academic literature in the field.